This bracelet is the culmination of a few years work, lots of samples and lots of twists and turns. It began with a flower, moved through a lariat, and lots of other steps to turn into this. 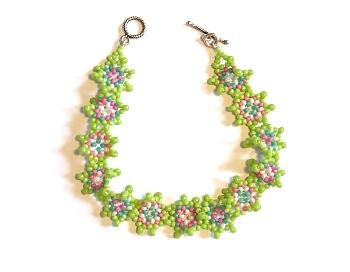 This bracelet was beaded in the autumn of 2004 and is the last piece I have done which sits in the Peyote Bobbles series. However, I took ideas from this, and my Fabulous Fringes series, and mixed them together in my Dagger Flowers series.